Some Soviet songs about Moscow sound fake because they are too ideological: Their authors knew nothing about the city and composed them for career reasons. Yet all the songs deserved to be reviewed — this is our history, after all. In Russia, if you want to make a career in any profession, you should go to Moscow. Moscow was a city of dreams for many generations of Russians, and it still is. Many Russian songs were dedicated to Moscow, or to its most beloved areas, such as Arbat. The first popular songs about Moscow in modern Russian history were produced at a time when movies, TV and radio were becoming a part of daily life. One of those can be found in the 1941 romantic comedy “Svinarka i Pastukh” (“Cowgirl and Shepherd”). Looking back at this song, we can identify how Stalin’s politics of “friendship of nationalities” worked in the Soviet Union. It was an attempt to create an unnatural love story between a Russian girl from a northern village and a shepherd from Dagestan, using Moscow as some kind of happy glue. This policy echoes even in today’s Moscow, which faces problems on a daily basis with migrants from Muslim North Caucasian republics like Dagestan. Now, more and more people in Moscow are considering separating from the Northern Caucasian republic, due to cultural and civilizational differences. 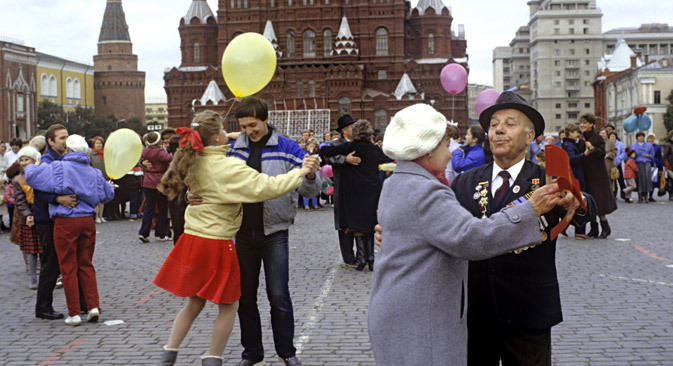 One song written during World War II, “My Beloved Capital,” was turned into an official Moscowanthem in 1995. This song was created by one of Stalin’s favorite composers, Isaak Dunayevsky, with lyrics by Lisyansky and Agranyan. The lyrics of the future song were first published as a poem in “Noviy Mir” (“New World”), a major Soviet literature magazine. Dunayevsky read the poem in the spring of 1942 and immediately wrote a melody to it. He unsuccessfully tried to find the author of this poem through the magazine’s editors. One line of the song lyrics praised Stalin, which was a very common practice during Stalin’s dictatorship, up to his death in 1953. After Stalin’s death, this line disappeared from the song, along with any favorable mention of the dictator in film, theatre, literature, and city names and streets. During the short-lived “Khruschev’s spring”—a time when some democratization and civil liberties were allowed in the Soviet Union in the late 1950s and early 1960s — few new songs about Moscow were recorded. A twist-like pop tune, “The Greatest City on Earth,” was recorded by composer Arno Babadzhanyan and performed by beloved singer Muslim Magomayev, who was a kind of Soviet Elvis Presley in some critics’ opinions. The song was enormously popular among the young Soviet generation at dance parties in the 1960s — not for its lyrics, which were a very typical type of Soviet aggrandizement, but for its beat and melody. Some songs about Moscow are very sentimental, and some of them can move listeners to tears: The opening tune in the feature film “Moscow Does Not Believe in Tears”is the one of these. The film won an Oscar Academy award for the best foreign-language film in 1980. Maybe this sentimental tune about Moscow, called “Alexandra,” helped with the decision of the Academy’s committee. Another example of a sentimental tune about Moscow is “Goodbye Moscow,” which was written for the closing ceremony of Moscow’s Summer Olympic games in 1980. Thousands of Soviet citizens cried in front of their TV sets during the live TV broadcast from Moscow’s Olympic stadium, when a symbol of those Olympics — a teddy bear called “Misha” — flew out with balloons into Moscow’s night sky. “It’s getting quiet in the stadium rafters. You can now return to your forest in the fairy tale. Since Moscow is a gigantic city occupied by more than 12 million citizens, many songs were written as a dedication to certain areas of the city. Arbat is an historic area in the center of Moscow, and many songs are dedicated to this space. The famous Russian poet and writer Bulat Okudzhava lived for many years in Arbat, and he frequently expressed his love for Arbat in his songs. His soulful voice and sometimes very sentimental and sensitive lyrics resonated with the Soviet people through underground reel-to-reel recordings exchange. Arbatis the one of main tourist attractions in Moscow today. A few songs about Muscovites were written by underground rock groups during Soviet times, expressing despise for the capital. This is like the other, darker side of the Russian dream of moving to Moscow in search of fame and fortune. Some who wrote these hate songs about Moscow were honestly of that opinion and others were motivated by jealousy and envy of others. “Nobody loves us here [in Moscow]. And we don’t like them. But we are not like them. We take a taxi even we have no money. We drink our cheap wine and somebody’s cognac. I don’t like Taganka. I hate Arbat. One of the most annoying songs about Moscow of all time is called “Moscow,” by a pop singer Oleg Gazmanov. Former Moscow Mayor Yuri Luzhkov, who was a fan of Gazmanov’s music, decided to have this songplay every time a train was arriving at one of the nine train stations in Moscow. Since hundreds of trains arrive daily to Moscow, this tune played numerous times through PA systems in train stations on a daily basis. Just this year, a proposal was made to ban this tune from playing at train stations. If this proposal succeeds, it will be credited by Muscovites as one of the real achievements of current Moscow Mayor Sergei Sobyanin. One of Moscow’s biggest problems is related to overpopulation and constant expansion of the city’s borders. The popular hip-hop group Noize MC and its leader Ivan Alexeev wrote a song called “Moscow Isn’t Made of Rubber,” stating that Moscow cannot be stretched forever with the constant growth of its population. By now, we can find hundreds Russian songs about Moscow written in the last 70 years — songs ranging from unconditional love and praise to the dark humor and humiliation. Yet only one of these songs can be called the undisputed champion among songs about Moscow. This is “Moscow Nights,” written by composer Vasily Soloviev-Sedoi and lyricist Mikhail Matusovsky. Besides huge popularity in Russia, it is the only Russian song about Moscow that has been covered by many foreign singers and translated into several different languages. This song became well-known after it was used during Moscow’s International Youth Festival in 1957. A memorial plaque — “Moscow Nights song was conceived here”—was put on the apartment building in the center of Moscow where the lyricist Matusovsky lived. The British jazz group Kenny Ball and his Jazzmen recorded this tune as “Midnight in Moscow," which reached the number-two position on the U.S. Billboard Hot 100 chart in 1961. Since then, no other Russian song has enjoyed this kind of popularity and worldwide recognition. This “Moscow Nights” tune could be a solid candidate for the next Russian National Anthem. Right now, an old, Soviet, “Stalin”hymnis being used as the country’s anthem, and it is just a matter of time before a new search for a national anthem will be announced.